“Yesterday, I discovered that The Times (UK), a well-respected newspaper owned by News Corp., is involved in an extensive campaign to spam social media websites with links to Timesonline.co.uk articles.” Andy Baio on the Times’ involvement with SEO. “I don’t think I’ve read an article in the last year that speaks about email as much other than an irritant.” This one, however, makes some very interesting claims. Hosted subversion and continuous integration specifically for Rails development. Looks interesting; reasonably competitive pricing. Back in the day we said of the original: ‘When Rez eventually turns up cheaply it will become indispensable, but until then it’s a luxury.’ Xbox Live Arcade is, then, our modern printing press: digital distribution transforming the expensive and exclusive into the affordable and inclusive. Emphasis mine. I liked that quite a lot. Notes from a talk by Will Wright in 1996. So much good stuff in here; it’s almost certainly going to get a dedicated blogpost soon. 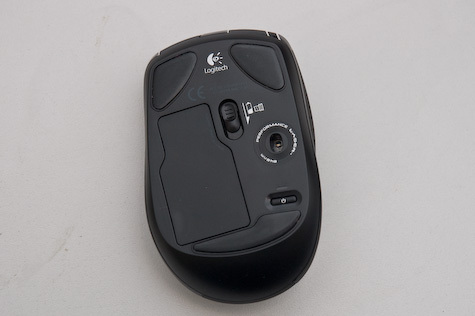 This is the Logitech VX Nano. 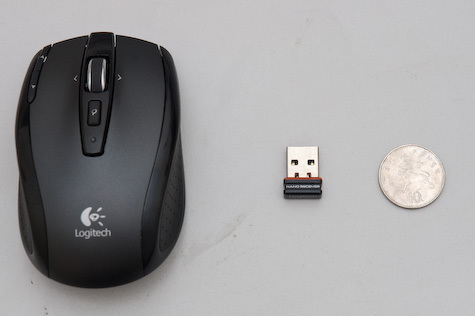 It’s a wireless laptop mouse, so it’s quite small. It’s not bluetooth; it has a wireless receiver. The wireless receiver is stored inside the battery compartment, on the underside. Here’s the view inside the battery compartment: two AAA batteries stacked, and the receiver just above it. 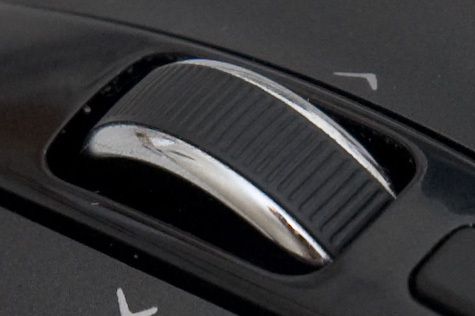 You push the eject button to pop the receiver out. 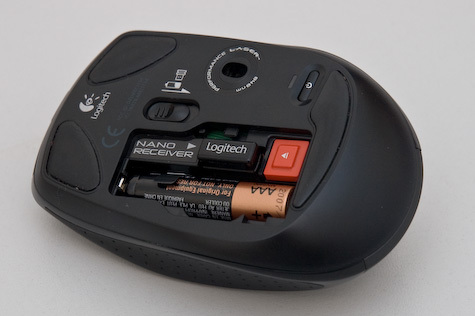 When you pop it out, the mouse turns on; when you click it in, it turns off. 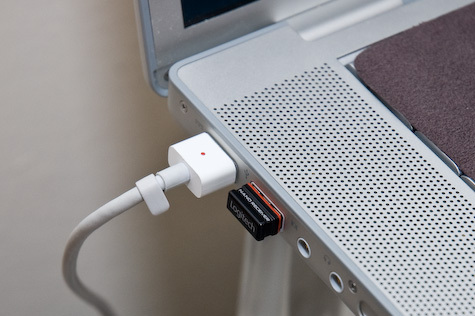 You can also turn the mouse off with the power button you can see – eg, when you’re putting your laptop to sleep. It’s so small it doesn’t even stick out the side of the new Apple keyboards. So the receiver’s a marvellous feat of engineering. But it doesn’t stop there; it’s also a lovely mouse to use. There are five buttons: left and right, obviously; button 3 is the small “search” button; buttons 4 and 5 – nominally back and forward – can be seen top left. 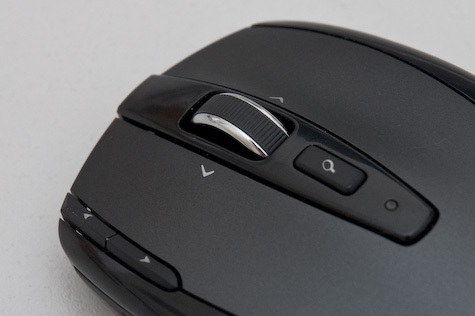 What’s really exciting is the mousewheel. The wheel is weighty, metal, and has a rubberized grip. It’s 2D – you can nudge it left and right. That’s not the cool bit, though. When you move the scrollwheel, to begin with, it subtly clicks as it passes each detent. So far, so scroll wheel. However, when you push it down, it clicks very loudly, and with a great mechanical feeling. And then, when you spin it… there’s no resistance. It spins entirely freely; the ratchet disengages. And all of a sudden, you understand why it’s a weighty bit of metal – it acts as a flywheel, and spins very freely. You can gently roll it, flick it, and stop it immediately with a light touch. And then a single click puts it back to detented mode. 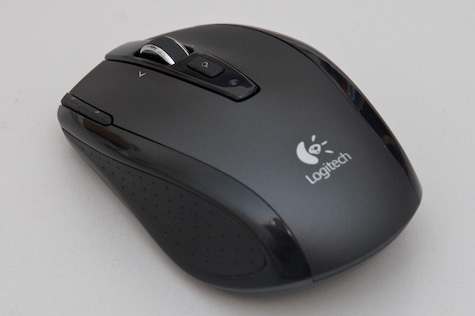 It’s a wonderful device; a really nice mouse, with lots of lovely design features that manage to be stylish, technically brilliant, and genuinely useful; I’m enjoying it more than my previous Microsoft laptop mouse (which was great, despite its somewhat oversized receiver). It even comes with a small mesh bag for you to put it in. Why do I like that? 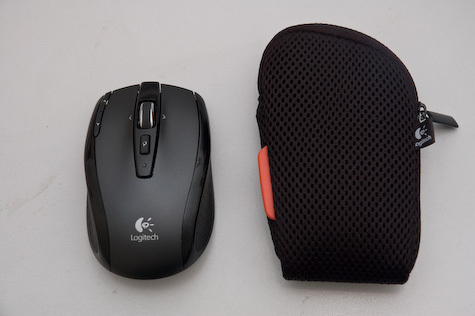 Well, it shows that Logitech know that a) you’re going to transport the mouse around a lot and b) that they want you to treat it as a premium product. If you throw it into your bag, it’s going to get all dinged up and scuffed in no time. So you also get a nice, fairly anonymous, perfectly-sized neoprene/mesh bag. It’s the little touches that make a lot of the difference. A thoroughly recommended product – and it still makes me grin every time I eject that receiver. “The Telegraph will soon become the first newspaper in the world, and the first British media company, to become an OpenID provider. Readers will be able to begin using the service from the end of February.” That’s an interesting – and savvy – move. “After the toy-hacking workshop I realised how awful I am at soldering… I want to be good at soldering… partly because I like all that MAKE magazine stuff and I feel like if I’m good at soldering those people will like me.” Russell being excellent. Fifty photographs of directors at work. They made wonderful films; these are wonderful photographs. “Candyfab was first built using three sacks of granulated sugar, an aquarium pump, a car jack and some recycled printer parts. And it only bloody works.” Fabulous. “Instead, user research for the Web should delve into the qualitative aspects of design to understand how and why people respond to what has been created, and, more importantly, how to apply that insight to future work.” Lane Becker on fine form. Lots, and lots, and lots of old Pelican book covers. Delightful. “The first incarnation of The Commons is a pilot project we’ve created in partnership with The Library of Congress.” Oh gosh. There’s so much wonderful, remarkable photography in here; I could lose myself. “ScreenSteps brings simplicity to the labor intensive process of software documentation.” Focusing on the screengrab, rather than video, as instruction tool. Could be a nice approach, especially if export is any good. “This smart energy saving meter from efergy will enable you to monitor and calculate the cost of running your home or office lights and appliances, and so help you work out your carbon footprint.” Not quite a Wattson, but cheaper, for sure. “Snipplr is a public source code repository that gives you a place to store and organize all the little pieces of code that you use each day… Did we mention it works with TextMate, too?” Looks good! “This is a site for large data sets and the people who love them: the scrapers and crawlers who collect them, the academics and geeks who process them, the designers and artists who visualize them.” Aaron Swartz strikes again. This looks great.